It seems like there are so many magazine covers to go around that publications shouldn’t have an issue with finding space for women of color, but according to Fashionista’s yearly report, a lot of them went to Nicole Kidman. Well, only four, but that’s still more than Zendaya and Solange, who had three. (Emily Ratajkowski, Gal Gadot, Gigi Hadid, and Bella Hadid had three, as well.) 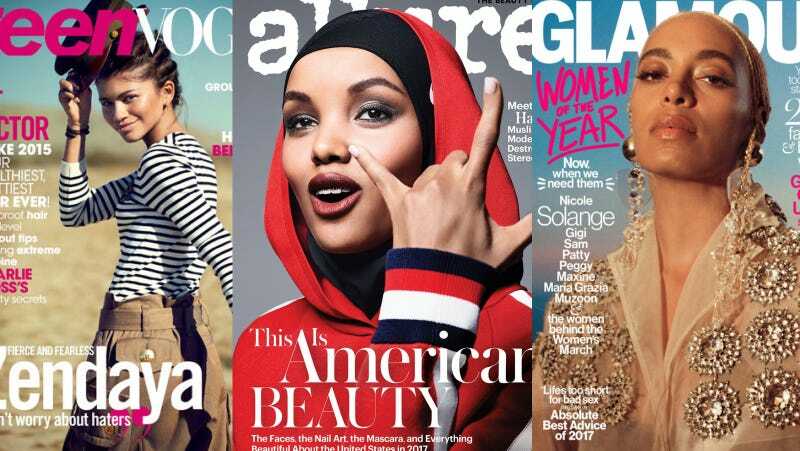 Fashionista discovered a few other disappointments, noting a decline overall in racial diversity on the covers of Cosmopolitan, Elle, Instyle, W, and Teen Vogue, though that publication did feature the most diversity overall. Vogue has actually improved, with six covers featuring people of color versus only four in 2016—Ruth Negga, Liu Wen, Imaan Hammam, and Adwoa Aboah on a shared cover; Selena Gomez, Zendaya, Zayn, Imaan Hammam and Pharrell Williams on a shared subscriber cover. But fewer covers across the publications tallied by Fashionista represented a dip of 3.5 percent since last year. That may sound low, but consider how hard it was to push the numbers up at all. On the bright side, age diversity went up, with seven covers going to women in their seventies and up. But as Fashionista grimly notes, “We would be remiss, however, if we also did not acknowledge notable lack of both Asian diversity and transgender visibility across the board.” Ugh. Nicole Kidman, stand down.